Snow is a perfect theme for one of January and February’s Virtual Book Club with Kids themes and a classic Winter storybook for kids The Snowy Day by Ezra Jack Keats one of the unfortunate things in the UK is that we don’t get snow very often, however, we do have frosts and ice. One of the questions that always pops up with my children and with the classes that I have taught is why in winter do we use Ice on the roads. 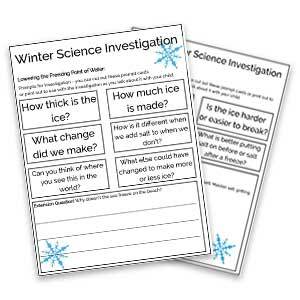 So this simple winter science investigation is ideal for kids to explore and draw their own conclusions based on their knowledge and level of understanding. As with all of our Virtual Book Club for Kids, posts don’t forget to check out our other suggestions for Featured Books for your weekly book basket on the theme of Winter as well as our co-hosts lesson plan with ideas for Winter themed fun and activities. More Inspiration for reading together with kids with our Recommended Winter books for Toddlers and Preschoolers. We have included affiliate links to products and resources we used and recommend for this activity. Camera or smartphone – these are the cameras that we have purchased for our kids to use they are fairly sturdy but provide a much better image and video than the kids cameras that you can buy. So that you can help your child draw some conclusions it’s worth understanding what is happening when salt is used on roads prior to snow or frost forming. The science is really simple – salt lowers the freezing point of water from 0 degrees to below freezing (this is also why there is still water in the Arctic and the Antarctic even in the middle of winter as the sea is salty) so by gritting the roads and path ways with salt frost and snow that land on it or try and form will only do so at a much lower temperature than they would otherwise. 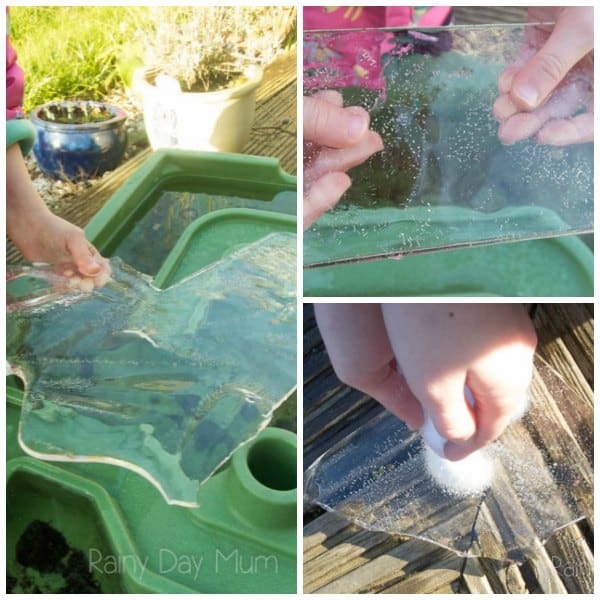 In this Winter Science Investigation we look at 2 different ideas – freezing icy water and what happens when salt is applied to already frozen water. 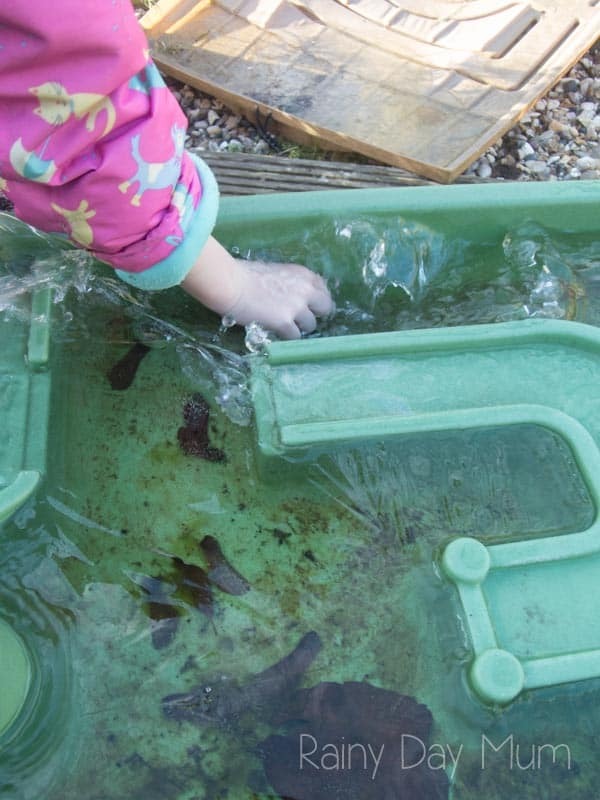 Using our water table we set up this over two different nights when we knew that the temperature would drop. If you live in a warm climate you could do this in your freezer as well but with careful timing to make sure that both the none salty and salty water have the same amount of freezing time and the same temperature. 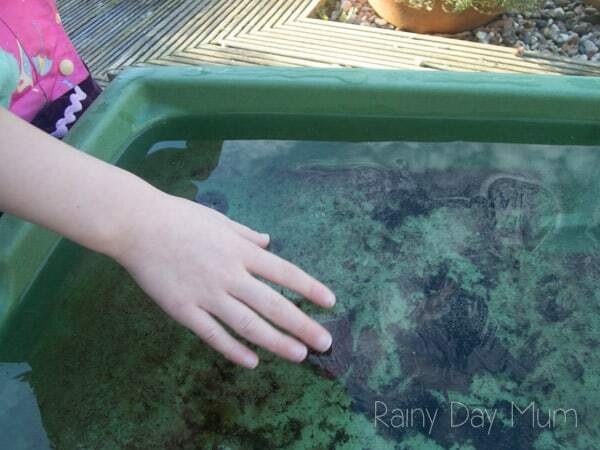 Start off by leaving your water table with fresh water in over night outside. 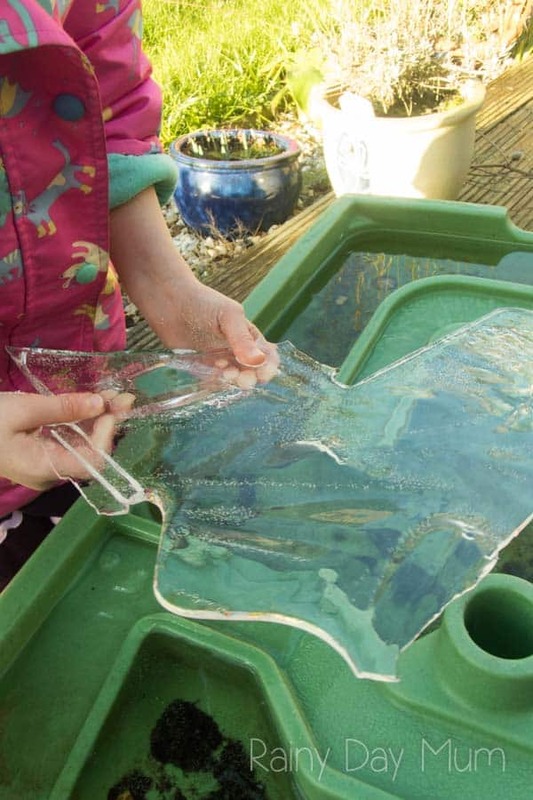 In the morning explore the ice to see how it’s frozen – look at the thickness of it, how much of the water table it has covered. 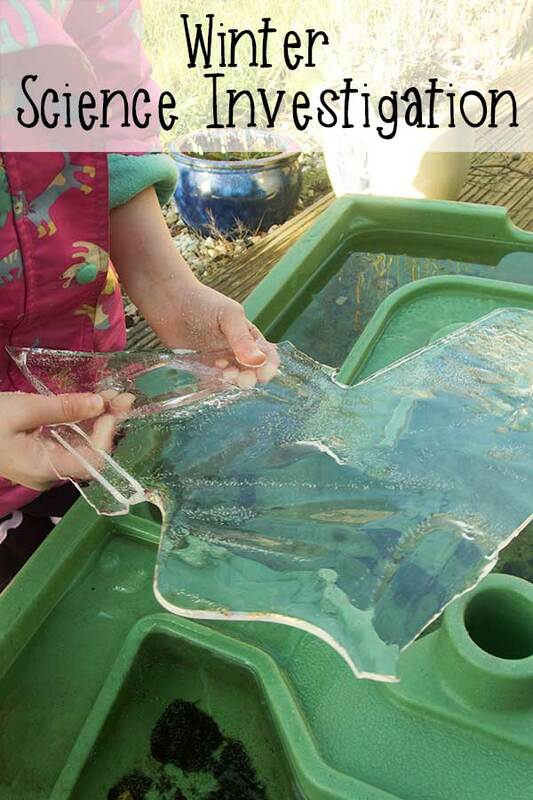 You and your child could photograph the ice and them touching it and exploring it. 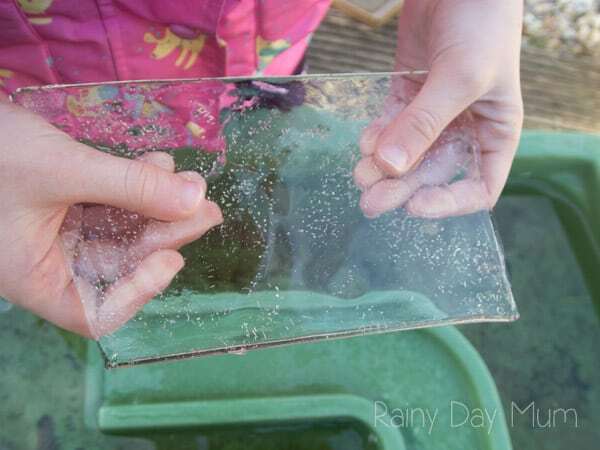 Now fill up your water table again and this time add in a cup or two of salt and help it dissolve by stirring. The following morning again look at the ice – has it frozen, is it as thick – use pictures that you took from the previous experiment to compare. Talk to you child about why they think that there is a difference, what does the salt do? If there wasn’t a difference what other factors could have changed? This was a favorite of both J and T they both loved see what happens and helped them understand why even when ice and snow has fallen during the day the roads are still gritted and salt applied to paths. 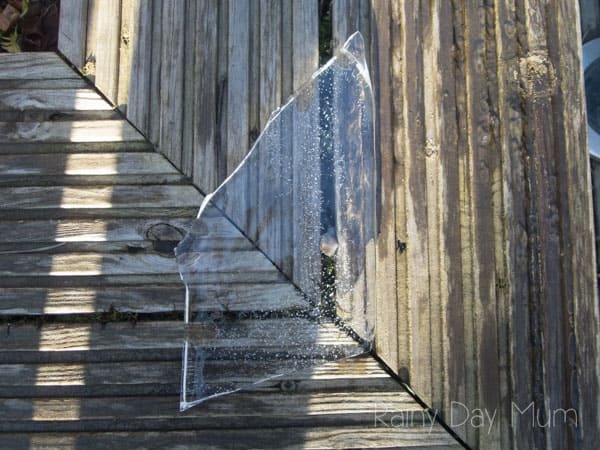 With some ice – you can freeze this in the freezer if it’s not cold enough where you are take a lid and add some water onto it and then place in the freezer so you have a sheet of ice. 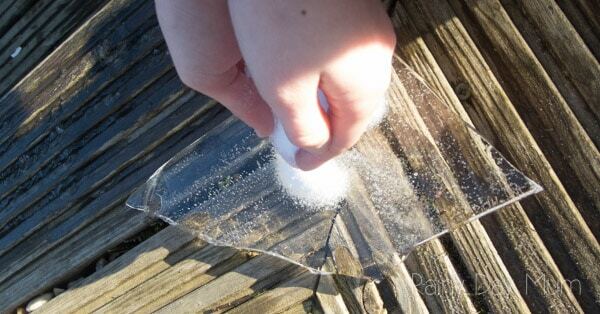 Now sprinkle ice onto the surface and watch. T videoed what was happened and then we spent time thinking about and explaining what was happening and causing the noises. Sign Up to get our Weekly Hands-on Activities for Kids newsletter with inspiration of activities and ideas for supporting your child as they learn. The Snowy Day by Ezra Jack Keats – our featured book and a classic beautiful story of winter fun for kids. Each week we join together with other bloggers to share our book themed Virtual Book Club for Kids lesson plan you can dip in and out of these activities throughout the week as you wish. Don’t forget to come and join us in the Virtual Book Club for Kids Facebook Group where you can join 6000+ others sharing activities and ideas for bringing books alive with children each week. Another related science lesson could be what makes fog. Freezing fog is even more interesting.